Lawton, T. F., McMillan, N.J., and McLemore, V. T., 2000, Southwest Passage: A Trip through the Phanerozoic: New Mexico Geological Society Guidebook 51, 281 p.
Kochelek, K.A., McMillan, N.,J., McManus, C.E., and Daniel, D.L., in press, Provenance determination of sapphires and rubies using Laser-Induced Breakdown Spectroscopy and multivariate analysis: American Mineralogist, http://dx.doi.org/10.2138/am-2015-5185. This paper was listed in the “Highlights and Breakthroughs” section of American Mineralogist. McMillan, N.J., Rees, S., Kochelek, K., and McManus, C., 2014, Geologic Applications of Laser-Induced Breakdown Spectroscopy: Geostandards and Geoanalytical Research, v. 38, p. 329-343. Uckert, Kyle, Chanover, Nancy, Getty, Stephanie, Brinckerhoff, William, Li, Xiang, Floyd, Melissa, Voelz, David, Xiao, Xifeng, Tawalbehy, Rula, and McMillan, Nancy J., 2014, A comparative study of in situ biosignature detection spectroscopy techniques on planetary surfaces: Aerospace Conference, 2014 IEEE, p. 1-12. 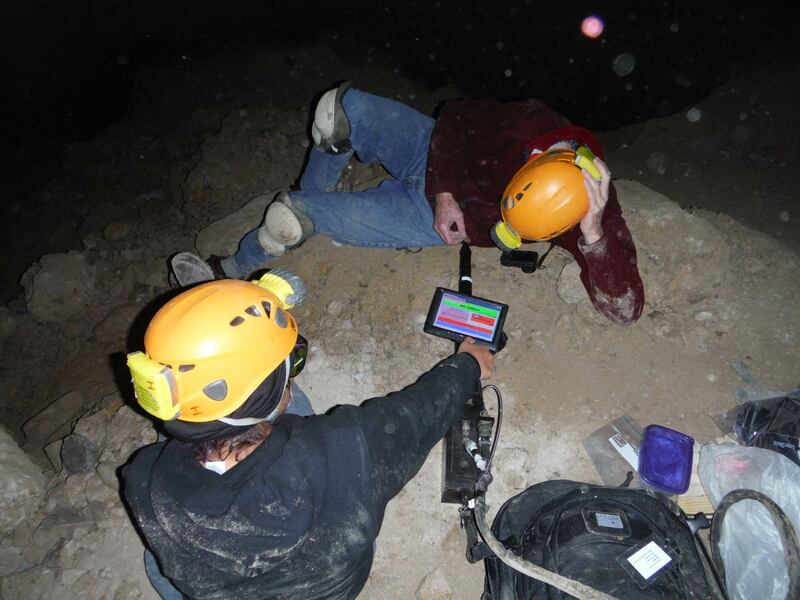 McMillan, N.J., Montoya, C., and Chesner, W. H., 2012, Correlation of Limestone Beds using Laser-Induced Breakdown Spectroscopy and Chemometric Analysis: Applied Optics, 51:B213-B222. Michelfelder, G. S., and McMillan, N.J., 2012, Geochemistry, origin, and U-Pb zircon ages of the Sierra Cuchillo Laccolith, Sierra County, New Mexico: New Mexico Geological Society Guidebook, 63rd Field Conference, p. 249-260. Harmon, R. S., Remus, J., McMillan, N.J., McManus, C., Collins, L, Gottfried, J. L., Jr., DeLucia, F. C., and Miziolek, A. W., 2009, LIBS analysis of geomaterials: Geochemical fingerprinting for the rapid analysis and discrimination of minerals: Applied Geochemistry, 24: 1125-1141. McManus, C. E., McMillan, N. J., Harmon, R. S., Whitmore, R. C., DeLucia, F., and Miziolek, A. W., 2008, Use of laser induced breakdown spectroscopy in the determination of gem provenance: beryls: Applied Optics, 47: G1-G9. McMillan, N. J., Harmon, R. S., De Lucia, F. C., and Miziolek, A. M., 2007, Laser-Induced Breakdown Spectroscopy Analysis of Minerals: Carbonates and Silicates: Spectrochimica Acta, Part B, 62: 1528-1536. Harmon, R. S., DeLucia, F. C., McManus, C. E., McMillan, N. J., Coveney, R., Jenkins, T. F., Walsh, M. E., and Miziolek, A., 2006, Laser-induced breakdown spectroscopy—An emerging chemical sensor technology for field-portable, real-time geochemical, mineralogical, and environmental applications: Applied Geochemistry, 21:730-747. One of the Top-50 most cited articles published in Applied Geochemistry between January 2006 and February 2011. McMillan, N.J., McManus, C. E., Harmon, R. S., DeLucia, F. C., and Miziolek, A. W., 2006, Laser-induced breakdown spectroscopy analysis of complex silicate minerals—beryl: Analytical Bioanalytical Chemistry, 385: 263-271. Buck, B. J., Merkler, D., Wolff, K., McMillan, N., 2004, Relict Water Tables Indicated by Salt Mineralogy, Las Vegas Wash, Nevada USA, IN Selim Kapur, Erhan Akca, Luca Montanarella, Arda Ozturk, A. Mermut Eds., 12th International Meeting on Soil Micromorphology, Adana Turkey; European Communities, v. EUR 21275 EN/2, p. 5-7. McMillan, N.J., 2004, Magmatic record of Laramide subduction and the transition to Tertiary extension: Upper Cretaceous through Eocene igneous rocks in New Mexico, in, Mack, G.H., and Giles, K.A., eds., The Geology of New Mexico: A Geologic History, New Mexico Geological Society Special Publication 11, 249-270. McMillan, N.J., and McLemore, V.T., 2004, Cambrian-Ordovician magmatism and extension in New Mexico and Colorado: New Mexico Bureau of Geology and Mineral Resources, Bulletin 160, p. 1-11. Giles, K.A., McMillan, N.J., and McCarson, B.L., 2002, Geochemical analysis and paleoecological implications of phosphatic microspherules (otoliths?) from Frasnian-Famennian boundary strata in the Great Basin, USA: Palaeogeography, Palaeoclimatology, Palaeoecology, v181: 111-125. Channell, R., McMillan, N.J., Lawton, T.F., Heizler, M., Esser, R.P., and McLemore, V.T., 2000, Magmatic history of the Little Hatchet Mountains, Hidalgo and Grant Counties, southwestern New Mexico: in, Lawton, T. F., McMillan, N.J., and McLemore, V. T., 2000, Southwest Passage: A Trip through the Phanerozoic: New Mexico Geological Society Guidebook 51, p. 141-148. Lawton. T. F., McMillan, N.J., McLemore, V.T., and Hawley, J.W., 2000, Second-day road log, from Lordsburg to Deming via Little Hatchet Mountains and Victorio Mountains, in, Lawton, T. F., McMillan, N.J., and McLemore, V. T., 2000, Southwest Passage: A Trip through the Phanerozoic: New Mexico Geological Society Guidebook 51, p. 17-30. McMillan, N.J., Dickin, A.P., and Haag, D., 2000, Evolution of magma source regions in the Rio Grande rift, southern New Mexico: Geological Society of America Bulletin, 112: 1582-1593. McMillan, N.J., McLemore, V.T., and Ervin, S.D., 2000, Cambrian tectonics of New Mexico and Colorado, in, Lawton, T. F., McMillan, N.J., and McLemore, V. T., 2000, Southwest Passage: A Trip through the Phanerozoic: New Mexico Geological Society Guidebook 51, p. 37-39. McMillan, N.J., McLemore, V.T., Amato, J.M., Hawley, J.W., and Giles, K.A., 2000, Third-day road log, from Deming to Victorio Canyon and the southern Florida Mountains: in, Lawton, T. F., McMillan, N.J., and McLemore, V. T., 2000, Southwest Passage: A Trip through the Phanerozoic: New Mexico Geological Society Guidebook 51, p. 31-44. Young, J.R., McMillan, N.J., Lawton, T.F., and Esser, R.P., 2000, Volcanology, geochemistry, and structural geology of the Upper Cretaceous Hidalgo Formation, southwestern New Mexico: in, in, Lawton, T. F., McMillan, N.J., and McLemore, V. T., 2000, Southwest Passage: A Trip through the Phanerozoic: New Mexico Geological Society Guidebook 51, p. 149-156. Garrison, J.M., and McMillan, N.J., 1999, Evidence for Jurassic continental-rift magmatism in NE Mexico: Allogenic metaigneous blocks in El Papalote evaporite diapir, La Popa Basin, Nuevo Leon, Mexico, in, Bartolini, C., Wilson, J.L., and Lawton, T.F., eds., Mesozoic sedimentary and tectonic history of north-central Mexico: Geological Society of America Special Paper 340, p. 319-332. Lawton, T.F., and McMillan, N.J., 1999, Arc abandonment as a cause for passive continental rifting: Comparison of the Jurassic Mexican Borderland rift and the Cenozoic Rio Grande rift: Geology, v. 27, p. 779-782. McLemore, V.T., McMillan, N.J., Heilzer, M., and McKee, C., 1999, Cambrian alkaline rocks at Lobo Hill, Torrance County, New Mexico: More evidence for a Cambrian-Ordovician aulacogen: New Mexico Geological Society Guidebook 50, p. 247-253. McMillan, N.J., 1998, Temporal and spatial magmatic evolution of the Rio Grande rift: in Mack, G., ed., New Mexico Geological Society Guidebook 49, p. 107-116. McMillan, N.J., Davidson, J.P., Wörner, G., Harmon, R.S., Moorbath, S., and Lopez-Escobar, L., 1993, Influence of crustal thickening on arc magmatism: The Nevados de Payachata volcanic region, northern Chile: Geology, 21:467-470. Davidson, J.P., McMillan, N.J., Moorbath, S., Wörner, G., and Harmon, R.S., 1990, The Nevados de Payachata volcanic region (18oS/69oW N. Chile) II. Evidence for widespread crustal involvement in Andean magmatism: Contributions to Mineralogy and Petrology, 105: 412-432. McMillan, N.J., Harmon, R.S., Moorbath, S., Lopez-Escobar, L., and Strong, D., 1989, Crustal sources involved in continental arc magmatism: A case study of Volcan Mocho-Choshuenco, southern Chile: Geology, 17:1152-1156. McMillan, N.J., and Dungan, M.A., 1988, Open system magmatic evolution of the Taos Plateau volcanic field, northern New Mexico. 3 – The petrology of andesites and dacites: Journal of Petrology, 29:527-557. Wörner, G., Harmon, R.S., Davidson, J.D., Moorbath, S., Turner, D.L., McMillan, N.J., Nye, C., Lopez-Escobar, L., and Moreno, H., 1988, The Nevados de Payachata volcanic group (18oS/69oW N. Chile): I. Geological, geochemical, and isotopic observations: Bulletin of Volcanology, 50:287-303. Dungan, M.A., Lindstrom, M.M., McMillan, N.J., Moorbath, S., Hoefs, J., and Haskin, L., 1986, Open system magmatic evolution of the Taos Plateau volcanic field, northern New Mexico. 1 – The petrology and geochemistry of the Servilleta Basalt: Journal of Geophysical Research, 91:5999 – 6028. McMillan, N.J., and Dungan, M.A., 1986, Magma mixing as a petrogenetic process in the development of the Taos Plateau magmatic system, New Mexico: Journal of Geophysical Research, 91:6029 – 6045. Dungan, M.A., Muehlberger, W.R., Leininger, L., Peterson, C., McMillan, N.J., Gunn, G., Lindstrom, M. L., and Haskin, L., 1984, Volcanic and sedimentary stratigraphy of the Rio Grande gorge and the late Cenozoic geologic evolution of the southern San Luis valley: New Mexico Geological Society Guidebook, 35th Field Conference, Rio Grande Rift: Northern New Mexico, 157 – 169.